Sound editing sits pretty outside of my realm of experience. Everything I’ve ever studied or worked on has been visual. So it was a little difficult to wrap my head around building something that I couldn’t see or sketch out first, only conceptualize. 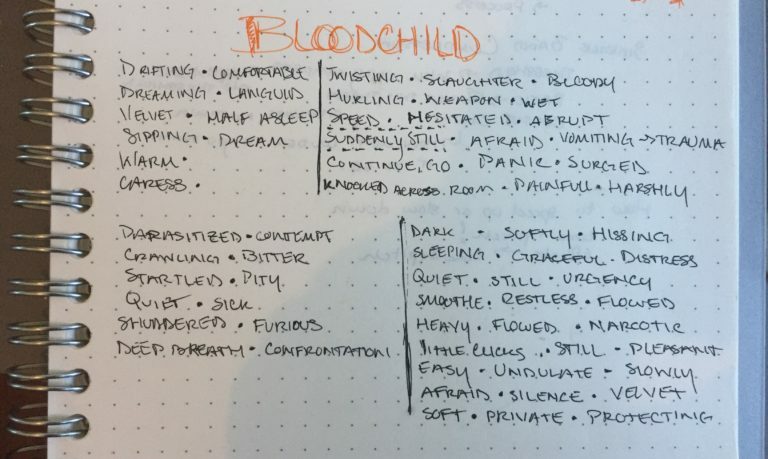 Our class was tasked with reading Octavia Butler’s “Bloodchild” and with a partner, crafting some sort of audio piece that went along with it. Nouf and I decided on a soundscape but not having worked in this way before, I think this definitely challenged our tendency to think too literally about the sounds we wanted. We had each read the story on our own, but we went through it again together, this time making separate word lists for the arcs we thought to be present. We seemed to be on the same page! And wanted to focus on getting as many sounds as possible that could match the descriptors we’d come up with. And while we collected sounds multiple times, in the park and our homes, when putting it together it still seemed like we were frequently missing EXACTLY what we wanted. We improvised because at some point it’s just not practical to go get a new recording every single time (especially when we were also battling learning to use Adobe Audition), but it’s frustrating to get to a place in the track where you can think of exactly the sound you want, have a decent library, even search online, and still not find it. But we did finally make something that we were pretty pleased with! It has a rhythm to it that we liked and we tried to make it transition smoothly through the arcs we’d imagined. I really enjoy the cyclical nature of it, returning to that beginning place of calm? It’s satisfying! So we exported it, saved everything to a flash drive and to dropbox, returned our borrowed computer (neither of us have Audition) and walked out. What we didn’t do was check to make sure the file we exported was correct. Theres a humming that runs through the beginning of our track that is currently not as present as it should be. And I’m upset with myself for letting it happen because it would have been easy just to adjust it and export it again if we’d checked. We’ll be trying to work out the correct version before class I’m sure, but for now we’re stuck with what we have. Thinking about where this piece lives, we had a couple other students listen to it as we were working on it. They called it unsettling… Which was great, It’s supposed to be! An unsettling audio reflection of an unsettling story!